These glow in the dark flyers provide an excellent opportunity to promote your message and/or logo in a very positive way. Not only are these flyers Child and Pet Safe, but they are easy to find at night. This is very helpful especially when children are playing with them. 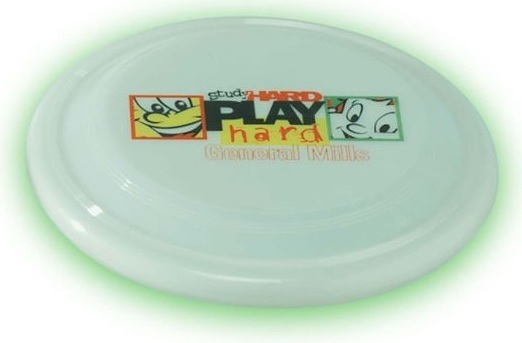 Two sizes of glow-in-the dark Frisbees available along with other styles available. Call or text 706-258-7041 and we help you not only select the best size for you, but also help with the design and production of your Custom Flyer. PET SAFE. 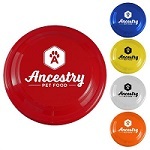 Dogs can make teeth marks in the plastic, but the frisbee flyer will not shatter and potentially choke the dog, and are often used to promote pet stores. 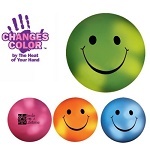 Pricing Includes: A standard one-color silk-screened imprint on one side. 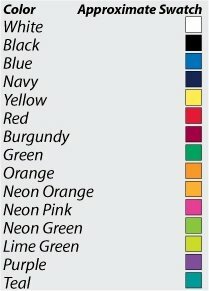 Imprint Colors: See Standard Imprint Color Chart below. 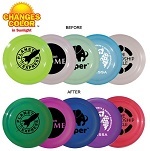 Additional charges apply if custom PMS color match is required. For logos and other artwork, add an additional $25 if high resolution vector art is not provided. 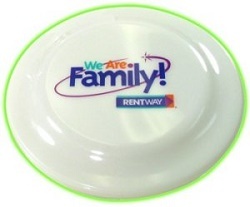 Prices above are for 1-color imprint.